Introducing digital marketing solutions from Boston Globe Media. LocalAxis offers a full range of digital marketing services for small and medium-sized businesses. For more information and a list of services, please visit localaxis.com. Now that we're half way through February (can you say summer? ), I thought it might be a good time to check in on my marketing goals and thought I would share my checklist with the Insights Blog readers. Below is a 2013 marketing goals check-in checklist that will hopefully help me and you stay on track to accomplishing your goals for 2013. 1. Am I blogging as frequently as I should? 2. Am I posting to social media sites as frequently as I should? 3. Are my posts, blog and social media alike, driving quality traffic? 4. Are my call to action buttons on my blog posts converting? 5. Do I need to add more lines to my lead generation forms on my landing pages to identify quality leads? 6. Are my landing pages effective in converting readers to leads? 7. Are my offers and/or promotions driving leads? 8. Are my print ads, display ads and mobiles ads driving clicks and leads? 9. Is my blog traffic increasing month over month? 10. Is my content resonating with readers and potential customers? 11. Am I and is my team attending enough networking events? 12. Am I staying on top of industry marketing trends? 13. Is my overall messaging positioning us as leaders in our industry? 14. Does my target audience trust me to deliver quality content? 15. Are the ways I'm measuring my goals effective? After answering all of these questions, I'll be able to tell what, if anything, needs to be adjusted within my marketing strategy to drive more qualified leads. It also helps me to decide where I should be budgeting my time and resources. 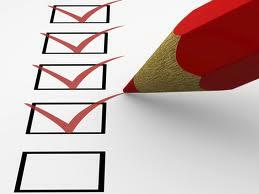 If you have a checklist you'd like to share, please add it into the comments below! Also, please let me know how you're doing on accomplishing your marketing goals in the months to come.